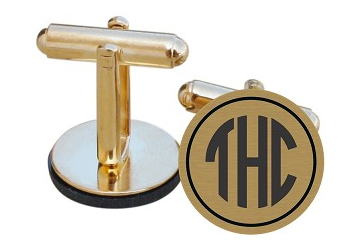 A classy, elegant, and timeless way to dress up any menswear formal attire is with a pair of engraved cuff links. They’re a fantastic accent at the wrist, and they add that personal touch to a great ensemble. Cuff links can be a great gift for any suit-wearing loved one, from birthdays to weddings to anniversaries and beyond. Frederick Engraving is the ideal source for the most sophisticated personalized cuff links, and our products will be cherished for years to come. Our cuff links are constructed of the finest and most unique mediums, so you’ll be sure to find the perfect individual touch of chic for anyone in your life. Shop our store to see our selection of phenomenally priced acrylic, wood, and metal cuff links. Whether they’re plated in 14 karat gold or rich white cherry wood, they’re guaranteed to create the perfect memento of a cherished event or tasteful gift. With the countless options for material, script type, and text featured on the engraved cuff links, you’re sure to find a fantastic way to treat any valued person in your life who likes to don a crisp shirt, suit, and tie. At Frederick Engraving, you can find something for every style and form of expression, and any celebration or occasion. Perhaps you’re looking for an anniversary gift with a reminder of the treasured date along with your and your spouse’s initials. Or your child has an important birthday coming up, and a pair of monogrammed cuff links would be just the thing to complete their wardrobe accessories. Or maybe you’ve got upcoming nuptials and want a subtle but snappy way to honor the tux-wearing members of your wedding party. Frederick can cover all these needs and more with our personalized cuff links. Our variations in style range from acrylic-covered in over 10 hues that will recognize someone’s favorite color or the aesthetic scheme of a wedding to the more traditional and refined gold, silver, bronze, and copper tones. Our wood cuff links especially stand out in their craftsmanship and look. They’re a great way to add some sophistication to a more rustic style. Through our text and font selection, you can find the perfect combination of personal tastes to complete a great look. Contact Frederick Engraving today to get some input on how to make your selection of engraved cuff links suit your ideal needs, or place an order online. We’re glad to bring some shine to a special day. Shop Engraved Cuff Links Now !